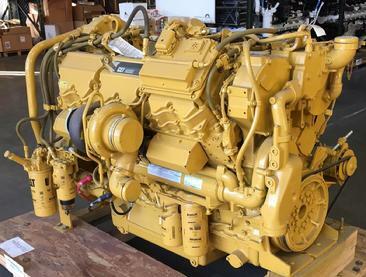 National Power Supply prides itself in the Caterpillar C27's, remanufactured and used. The reman Cat C27 is designed for many other applications. When looking for a reman Caterpillar, look no further than Natonal Power Supply for your needs. Our customers, like consumers everywhere, are looking for more value from Caterpillar's products and services. We build the engines to your specifications and needs. Remanufacturing refers to the process of restoring damaged, broken or products nearing the end of their usable lives to good as new conditions in the manufacturing environment. Caterpillar is one of the world’s leading manufacturers of diesel and natural gas engines and diesel-electric locomotives. It goes without saying that a caterpillar engine is a high quality product. There is definitely an upside in purchasing a remanufactured caterpillar engine and herein are some of the benefits it holds over a new one. Remanufactured caterpillar engines maintain the quality image of their original product. Caterpillar remanufactured engines meet the Original Equipment Manufacturer (OEM) guidelines and specifications. The used engines are dismantled, upgraded, reconditioned and repowered. The quality of remanufactured engines is exceptionally high since each component is thoroughly checked for defects. These checks are often absent in new engine manufacturing processes. As a result, huge savings are realized and the resulting engines are considerably cheaper than new ones. Producing a remanufactured engine requires 60 % less resources than producing a new one. Remanufactured parts are sold at 40% of the price of new ones with the same guarantee. A remanufactured caterpillar engine has less impact on the environment when compared to a new one. Their production leads to less greenhouse gas emissions, reduces the need to use raw materials, reduces energy consumption and limits landfill waste and water usage. When you buy a remanufactured engine, you get to meet your needs without negatively affecting the ability of future generations to meet their own needs. It is important to note that remanufacturing is an exchange process. Remanufactured products are not used goods. They bear the same reliability and quality of new products. FULL INVENTORY or Ready To build to YOUR Specifications on your Caterpillar C27 NOW ! ! !